EL MONTE – Potrero School kindergartener Kenia Lopez unwrapped her present from Santa Claus and began jumping up and down, hugging her new My Little Pony toy and showing it off to all of her classmates, while they too unwrapped a mountain of presents. Lopez and her classmates were given the presents and other treats on Dec. 19 by K-Earth 101, community members and organizations after her teacher, Lisa Gonzalez, was named the radio station’s “Knock, Knock, It’s Christmas” contest winner. Gonzalez, an 18-year veteran of the El Monte City School District, enjoys making Christmas a special time for her students – yet had limited funds to do so this year. She reached out to K-Earth 101 with a 500-word essay about why her students deserved to have their Christmas wishes granted. 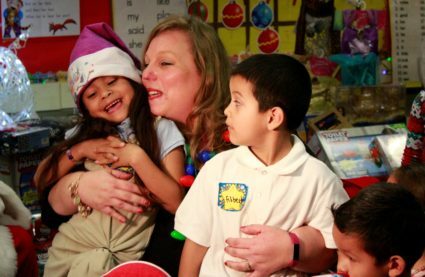 Gonzalez was chosen from thousands of entries and, as a result, her class received the Christmas party, presents, holiday treats and a visit from Santa Claus. The K-Earth 101 team decorated the classroom with a wall of toys surrounding two Christmas trees covered in lights and ornaments, reindeer and snowmen, lights strung up on the ceiling and stockings on the chairs. Each student also received treat bags with lollipops, applesauce and candy canes in addition to wrapped presents such as a Beauty and the Beast tea set, American Girl dolls, sports equipment and new backpacks featuring popular TV and movie characters. One of Gonzalez’s main reasons for reaching out to K-Earth 101 was because of student Dikang Chen, who has cerebral palsy. Gonzalez said her other students have shown kindness and empathy to Chen and that their compassion deserved a big reward. One donation was a Gait Pony Trainer from Western Drug Medical Supply. The tool is a wheeled mechanism Chen can use to help walk and be more mobile. The school had been using a borrowed, older model. K-Earth 101 also asks its listeners to join in on the donations. The 22 Potrero School families received gift cards and meals from Grocery Outlet. Limin Wang, Dikang’s mother, was awestruck by the generosity of the community and K-Earth 101. El Monte School District Superintendent Dr. Maribel Garcia said credit for the surprise goes to Gonzalez and her students. EMCSD_WISH1: Potrero School teacher Lisa Gonzalez cries as she tells K-Earth 101 representatives how grateful she is that her kindergarten students enjoyed the Christmas celebration she believes they truly deserved. EMCSD_WISH2: Potrero School kindergartener Evangeline Agundez, 5, shows off Santa’s gift to her – A My Little Pony toy – received during a surprise Christmas party thrown by K-Earth 101 on Dec. 19. Potrero School teacher Lisa Gonzalez cries as she tells K-Earth 101 representatives how grateful she is that her kindergarten students enjoyed the Christmas celebration she believes they truly deserved.